Troparion: You were enlightened by the words of Paul, O Bride of God, Thekla, And your faith was confirmed by Peter, O Chosen One of God. You became the first sufferer and martyr among women, By entering into the flames as into a place of gladness. For when you accepted the Cross of Christ, The demonic powers were frightened away. O all-praised One, intercede before Christ God that our souls may be saved. 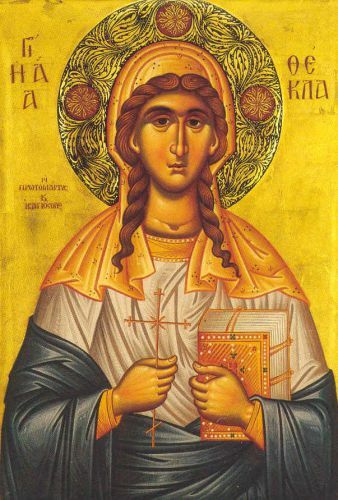 Kontakion: O glorious Thekla, virginity was your splendor, The crown of martyrdom your adornment and the faith you trust! You turned a burning fire into refreshing dew, And with your prayers appeased pagan fury, O First Woman Martyr!